Monica is a professional photographer, author, and volunteer for our stroke camp and for other camps dealing with other types of brain injuries. I bought her book on surviving the holidays last year and I highly recommend it. Sometimes we don't realize why we don't feel as happy around the year end holidays we think we should. I mean, why not?! Her book will help you through that. Yes, ‘tis the season for THAT holiday spirit … which means something different to each of us human beings who recognize traditional and ceremonial dates as winter and a new calendar year blow our way. In the United States, Thanksgiving and Christmas are the most widely celebrated and “legal” holidays. However, not everyone is enthused about the arrival of THE holidays, and there are more people dreading this time of year, many, many more than you think. If you feel that way, you're not alone. I admit that I do struggle with the holidays and have for years. I remember tragedies and losses during these closing weeks of the calendar year, and the ink of those impressions have a sense of permanency simply because of when they happened. And I am not alone. What I have discovered is that it's all perspective, and everyone has one, as unique as our DNA. While we cannot force someone to change that perspective, we have the power to influence those thoughts and observations in a positive, loving, supportive way. And it's not done in the noisy parade of the holidays, but the quiet corner of personal connections this and any time of the year. It's all about listening and sharing. It's about helping unwrap the complicated emotions of the holiday experience one layer at a time. It's about exploring the deeper meaning of our human bonds. It's about unwrapping and sharing yourself, the real you, perhaps the most precious gift of all. 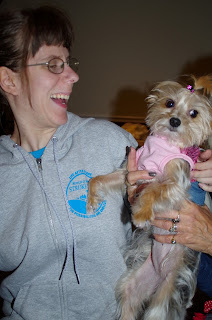 As a caregiver do you feel frustration, irritation, anger, even guilty? Guess what? According to the experts that's normal during the course of caregiving. The challenge is for you to recognize this and learn how to manage it. I hope you find something in this post that will help you. On some devices the two following links will download a pdf file if you open with your browser. If you get the choice, it might be best to open with a pdf viewer, if you have one, otherwise you'll have to search your device for the pdf file, but it will be worth it. Click here for a Caregiver Guide To Stroke. Also...Give thanks to your unsung hero! Caregivers give so much of their time, their hearts and themselves to the people they care for. They ensure the big and little things are taken care of for you during recovery – from brushing your hair to driving to doctor visits. 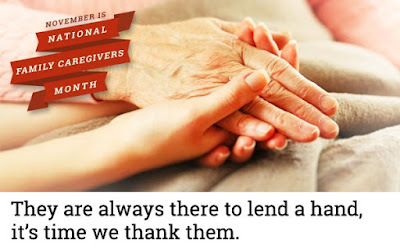 November is National Family Caregivers Month and we are urging you to honor the caregiver in your life by posting their picture and a thank you note on the Support Network. 1. 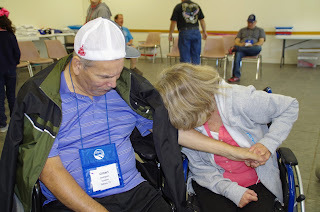 Take a picture of your caregiver, be as creative as you like. 3. Once it’s up we will send you an email so you can let your caregiver know about it. Submit your photos to us between November 1st and November 30th. 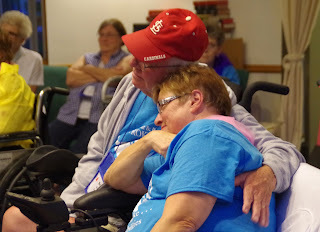 There's no better job in the world than being a volunteer for Retreat & Refresh Stroke Camp, and being able to capture so many special memories with my camera makes the experience even more priceless. I had no idea when I starting shooting photos at my first camp in June 2008 that I'd create this obsession with photographing people and amass this collection of thousands and thousands of images. But what I witnessed was amazing and beautiful from Day 1, and that love continues to this day. I give so many thanks to Marylee Nunley, executive director of Stroke Camp, who invited me to find my own way to reach out to stroke survivors and caregivers. She has this unique ability to bring out the talents and skills of volunteers during that service to campers. That experience truly changed the course of my life in the best way possible. I'm extremely blessed to have about 70 of my favorite and the most meaningful photographs I’ve shot in the last nine years, on display during November at the downtown gallery of the Peoria Public Library. 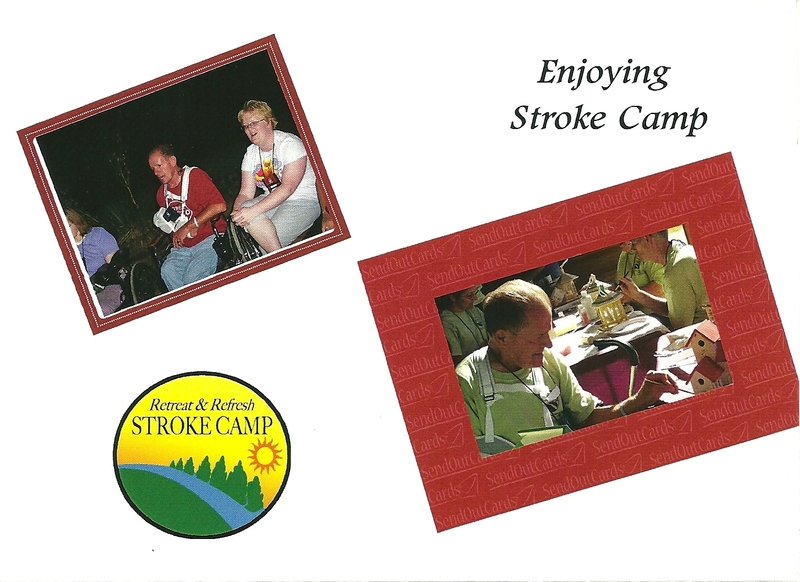 Many of these images come from the 89 Stroke Camps I've attended across the country, in addition to the traumatic brain injury camps I connected with starting in 2012. If you're in the Central Illinois area, please stop by to see me and the exhibit at a special reception at the gallery in downtown Peoria from 1-3 p.m. Saturday, November 19. You'll also find display cases filled with examples of assistive devices on loan from Stroke Camp. October 2016 ended as a very sad month for us. We at Retreat & Refresh Stroke Camp lost a great friend, volunteer, and ambassador, Larry Morris. CMSGT Larry "Chief" Morris, 75, of East Peoria passed away at 10:20 p.m. Sunday, Oct. 16, 2016, at Snyder Village in Metamora, Illinois. 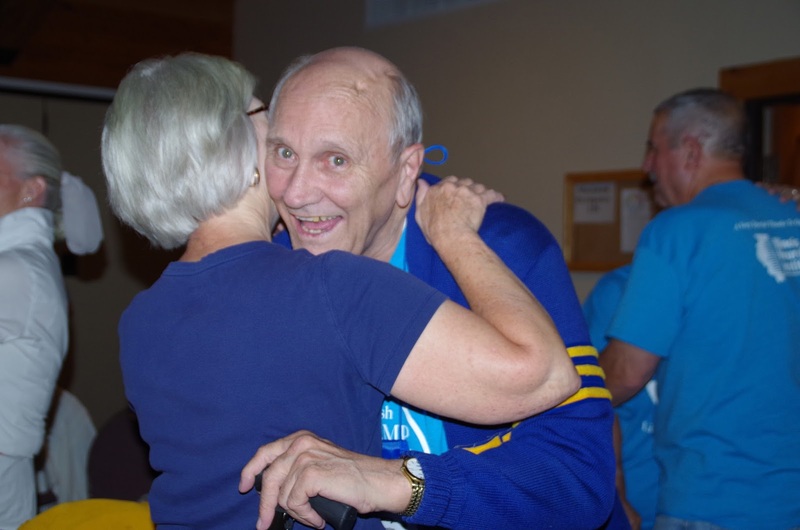 Larry was with the Peoria Air National Guard for 35 years, retiring in 1994 as Chief Master Sergeant, being one of the youngest to achieve that rank. He was a member of the Retreat & Refresh Stroke Camp since its inception in 2004 and served as a founding board member. Larry, along with his wife and caregiver, Georgia, have volunteered at our camps since its inception in 2004. 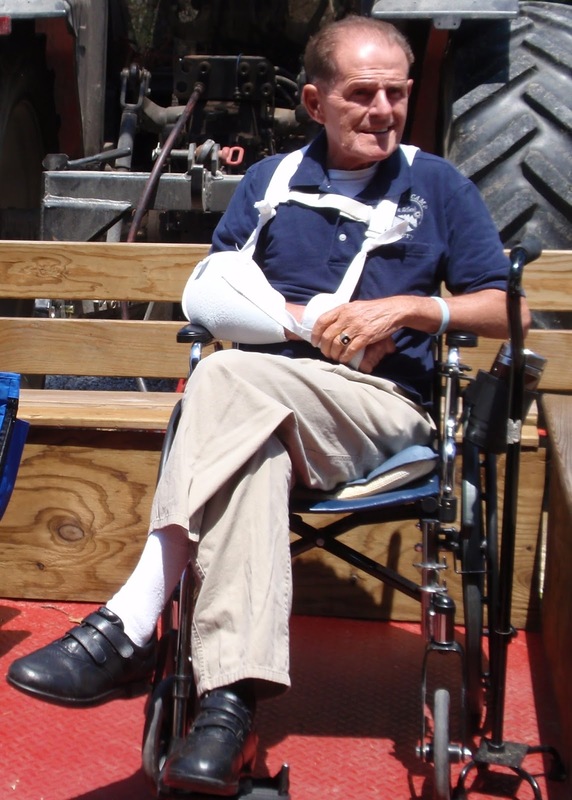 Larry survived his stroke for 18 years and in the last eleven years with us he gave hope and comfort to hundreds of other stroke survivors, sea to sea, border to border, across our nation. He is and will always be greatly missed. 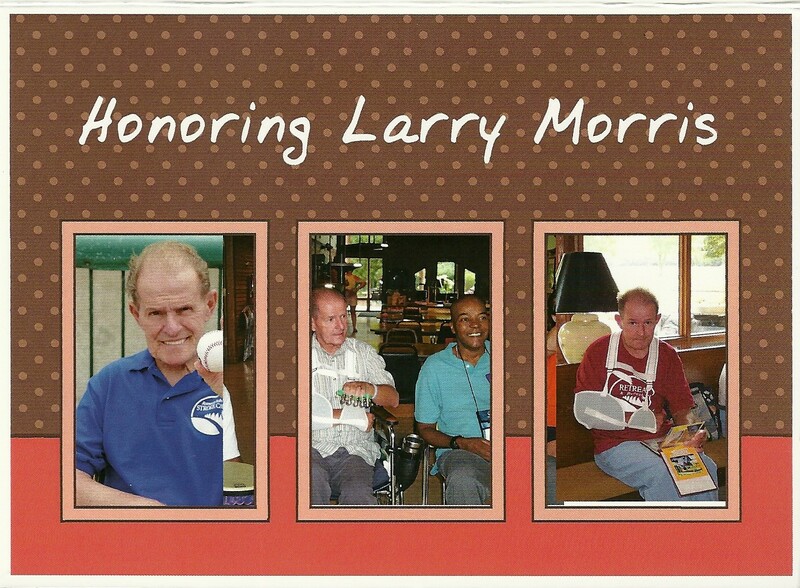 Larry was Chief Master Sergeant in the Air National Guard prior to his stroke so the following site had a very special meaning to him. We were on our way to one of the Lincoln, Nebraska stroke camps and he and Georgia wanted to stop and see this. It's called Freedom Rock. I have a lot of good memories with Larry and Georgia. Some of them involved traveling with them to out of state camps. Normally all our camp crafts, supplies, skit things, audio/visual equipment, drum circle instruments, etc. are hauled in the camp van but sometimes we have two camps scheduled for the same weekend so we need another way to get the stuff to the second camp. They had a truck with a hitch, the camp had a trailer full of stuff that needed towed, and I knew how to drive. Perfect! My other memories are going out for lunch back home every so often with him and John Nunley, a stroke survivor also, co-founder of the camp and husband of Marylee our Executive director. I liked those lunches and traveling with Larry. Yes, Larry is missed.